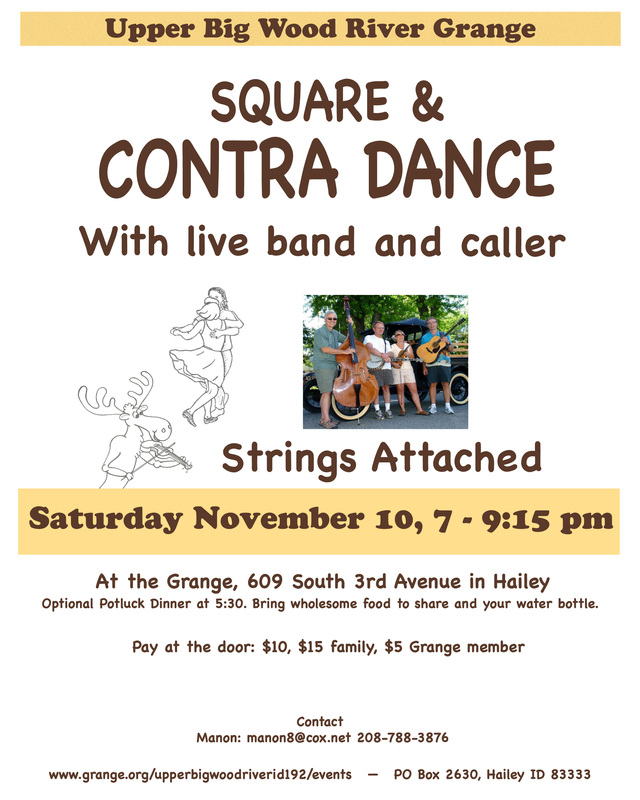 Potluck and Square & Contra Dance on Saturday November 10, with live band and caller Strings Attached, at the Grange Hall, 609 South 3rd Avenue in Hailey. Pay at the door: $10 for adults, $15 for a family, $5 for Grange members. Free for young kids. Attendance is limited to 70 people. Please bring and wear clean shoes that will not mark the floor. Our dancing event is a family-friendly activity for all ages. Singles and beginners are welcome. All the steps will be taught, and no partner is necessary. First and foremost, the event is about people and community. It is about meeting new friends, socializing, dancing and having an enjoyable experience together! The evening will begin at 5:30 pm with an optional potluck dinner. Gluten-free or other food sensitive eaters are welcome. Please label your dish accordingly. Bring wholesome locally prepared food to share, as well as your plate, fork and water bottle. Dancing will begin at 7:00 and end at 9:15 pm. The event is organized by members of the Upper Big Wood River Grange. Meta description: Dancing for the whole family as well as for singles. Beginners are welcome as all steps are taught before each dance.